Reportedly age 19 in 1880 census. Two of her unmarried children, Cecile and Robert, are living with her. She is listed as head of household, owner of the house valued at $5,000, and in possession of a radio. Living with her are two of her unmarried children, Robert and Cecile. The death certificate notes that she died at the Hotel Dieu in New Orleans. [S43] Census-US federal-1880, Ancestry.com, (1999. ), Louisiana, Orleans Parish, New Orleans; Roll T9_461; Family History Fil: 1254461; Page 277A; ED 38; Image: 0357 (Reliability: 1). Michel and Manuel Fauria and their wives living with Joiny Janetti and his family. [S288] Birth Certificate, Birth Certificate, Louisiana Vital Records (8 Nov 1888), Victoria Fauria. (Reliability: 3). [S144] Census-US federal-1930, United States Bureau of the Census, Year: 1930; Census Place: New Orleans, Orleans, Louisiana; Roll 805; Page: 17A; Enumeration District: 107; Image: 126.0. Family of Cecile Cagnolatti Fauria. (Reliability: 3). [S45] New Orleans Death Records Index 1804-1949, Ancestry.com, (Provo, UT: MyFamily.com, Inc., 2002. ), Vol 210, Page 2639 (Reliability: 1). 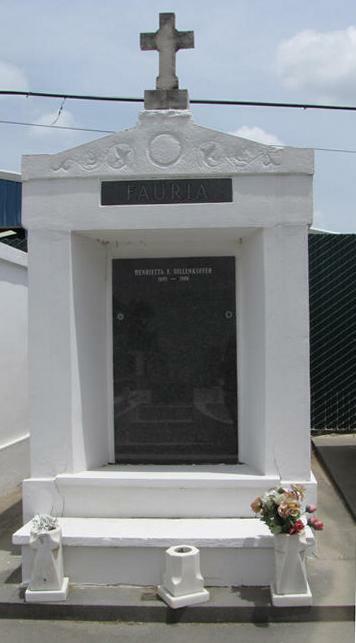 [S334] US-Louisiana-Orleans Parish-New Orleans-St. Louis Cemetery #3 Fauria Tomb ownership records, Saint Louis #3, Cagnolatti, Cecile. Burial 3 Mar 1938, Position V1. (Reliability: 3). [S5] New Orleans Marriage Records Index 1831-1964, (Ancestry.com. New Orleans, Louisiana Marriage Records Index, 1831-1964 [database online]. Provo, UT: MyFamily.com, Inc., 2002. ), Volume 7, Page 385 (Reliability: 1). [S227] Marriage Certificate, Fauria, Michel & Cecile Cagnolatti, Vol 7, page 385; 19 Apr 1879 (Reliability: 4).